Anyone that needs four calendars to keep themselves on track has got some SERIOUS stuff going on in their life. Bonnie Rivers is one of those people. If you were to look up “multitasker” in the dictionary, I wouldn’t be surprised if her picture popped up. Talking to me for an hour and a half was very likely the most down time she’d had all week. This young woman is a high-speed fireball with no intention of stopping. That’s a good thing too, because it looks like there will be no slowing down for her in the near future. 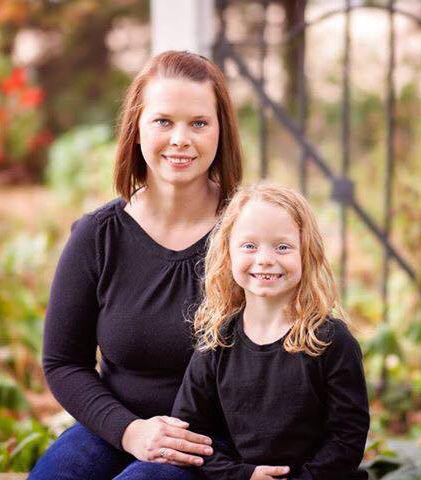 In addition to working full time as a Ward Clerk at Passavant Hospital, Bonnie is a single mom to her bright and beautiful 6 year old daughter Kelly. Bonnie and Kelly are about to be the recipients of a wonderful opportunity. Theirs will be the 23rd Habitat for Humanity house built in Jacksonville. To say that they are excited would be an understatement. Make no mistake, a Habitat house is far from being a handout. It takes a lot of work and commitment on the part of the applicant to make it happen. Habitat for Humanity was founded in 1976 with the vision of providing quality, low cost homes for people who meet their qualifications. Since their founding, Habitat has built or refurbished more than 1 million homes. There are more than 2000 affiliates across the globe. Each affiliate is an independent entity, with their own structure, requirements, policies and procedures. Each person that submits an application for a Habitat house must meet several preset conditions. An applicant must agree to a credit history check, have stable income/employment, and allow a home visit to ensure their housing standards are met. The applicant must be able to pay any closing costs plus property taxes and insurance, and are required to invest a minimum of 250 hours of “sweat equity” in the building of their new home. Habitat usually acquires the building sites through donation. They also do the financing. They offer 20, 25, or 30 year mortgages interest free. If the recipient falls behind on payments, they can also evict the person if necessary. Like a typical mortgage, taxes and insurance can be escrowed. Unlike a typical mortgage, house payments go back to Habitat so they are able to keep building houses for deserving families like Bonnie and Kelly. Bonnie didn’t even know what a Habitat house was until she was prodded into applying by a couple of her co-workers. She Googled it and thought that she may meet their qualifications. Bonnie applied without telling anyone, not even her family. When she found out she’d been accepted, she spilled the beans to her mom and dad. After a good session of “Dad Questions,” everyone was on board. Bonnie works Monday through Friday as a full time ward clerk. Then, in order to meet some of the sweat equity hours, since there is no home to work on yet, she volunteers at Passavant as well. Some days she works double shifts. Sometimes you’ll see her at the hospital seven days a week, volunteering on her days off. Then there’s school pickups and drop offs and tumbling class for Kelly. School work and mother-daughter time must also be figured in. Oh, and Bonnie also cuts hair on the side because she loves doing it. That usually takes place on Sundays in her kitchen. It sounds overwhelming to most of us but this young woman has got it figured out! She claims she had a brief moment when she was overcome with all the things she needed to do. So she took a step back, took a deep breath, told herself it would be OK, bought another calendar and got to work. Working is nothing new to Bonnie. Her first job was at Steak ‘n’ Shake at the age of 16. She stayed there for 11 years. I think Bonnie is the first person I’ve ever met who’s stayed at their first job for that long! She attended cosmetology school while she was working and she earned her license to cut hair. Bonnie started working at Passavant three years ago in housekeeping. Always showing dedication and a great attitude, she soon moved up into her current position as a ward clerk. Bonnie is very enthusiastic about her employer. She says she absolutely loves it there and plans to stay there until she retires (she’s only 31 now!). Her method of keeping on track with her goals is admirable. When anything doesn’t quite gel with immediate plans, she turns it over to the “Five Year Plan.” That’s for things that could happen soon but are not being focused on with quite so much intensity. She gave me the perfect example. In her daughter Kelly’s mind, a dog is a requirement if you have a house. While Bonnie was explaining to Kelly about their new house, Kelly thought for a minute then asked if they could get a dog. Bonnie laughed and agreed but immediately went back to “let’s just focus on getting the house built first.” She looked at me conspiratorially and whispered that the dog may have to go in the Five Year Plan. Bonnie has one more dream. She’s pretty sure there will be some extra room in their new house so she can have some dedicated space for cutting hair. That will be terrific, though she can’t help but dream about having her own full service salon someday. From what I’ve seen that shouldn’t be a problem for this high octane go getter! Keep up the great work Bonnie!! If you or someone you know would like more information about Jacksonville’s Habitat organization, you can find it at www.jubileehabitat.com or the national website www.habitat.org.